The 2nd house rules your disposable income, values, self-esteem, and self-worth. The sign on the cusp and planets within the house show what profession you could make the most money in. They also show how your approach money, and what your overall feelings are about money. They show how your values lean and what kind of ethical code you adhere to. Your own feelings of self-worth and esteem can be shown within this house as well. This house is considered one of the career houses, along with the 6th and 10th. The 2nd house is ruled by Taurus, Venus, and is a succedent house. You have a strong drive to make money, and are assertive in the ways that you go about making money. Your confidence can be linked to how much money you have or make, and the more you make, the better you feel about yourself. You can be a spendthrift at times, blowing money on impulse buys and things you don’t really need. You have to work at being financially disciplined. You can make money through something Aries-related, like the military, as an entrepreneur, as the boss, through sports, or through competition. You want a lot of money so you can spend on things of value, that are worth much in your eyes, or that seem luxurious. You can have expensive taste, only wanting the finest things in life, but you tend to stick to spending the money you have rather than how much you wish you had. You can be good at business, and take a practical approach to your finances. Making money can come easily to you. You can make money through something Taurus-related, like using your senses (food, drink, art, music, physical therapy, massage, as an audiologist, optometrist, etc.) or through finance. You take an intellectual approach to your finances, and use your mind to help you financially. You can spend a lot of time thinking about your finances, and come up with plans and budgets that come and go. You can adapt to whatever financial situation you find yourself in. You can make money through something Gemini-related, like writing, speaking, detail-oriented work, planning, with younger people (like teaching), or using your mind in some way. You can keep your money, save and invest wisely, and don’t want to spend too much on anything except your home or family. You could spoil your family but be cheap with everything else. Having financial security means a lot to you, and you feel emotionally uneasy when you’re finances aren’t in order. How much you make can ebb and flow, changing through your life constantly. You can make money through something Cancer-related, like through the public, nurturing others, in or for the home, or with or for family. You need to make money in your life so you feel good about yourself. How you feel about yourself is closely linked to your financial life. You need to learn to separate those two things. You may want to live like a king, and only go for items that others might think are tacky or gaudy. You can make money through something Leo-related, like in the public eye (especially in acting/through the theater), through work that helps other people, or work that makes people laugh. You know exactly what you want to do with your money, and keep track of every penny. You try to be practical with your finances, always having a sound plan, but you can deviate from it on a whim at times and get yourself in trouble. When your finances aren’t in good shape, you tend to be in bad shape physically, and the financial worry leads to physical illness. You can make money through something Virgo-related, like using the details, something with your mind, as an organizer, bringing structure or creating routines, with health, or with animals. You try to balance your budget and weigh the pros and cons of spending on certain items or investing in certain ways. If you feel like your financial life is out of balance, it really throws you off. You may make your money with the help of a partner, or through marriage. Your taste is expensive, but you don’t usually spend more than you have, and try not to blow your money on anything too frivolous. You can make money through something Libra-related, like the arts, the law, the beauty industry, fashion, or the wedding industry. You keep your financial life to yourself, not wanting other people to know everything you have or don’t have. You can make a lot of money in your life, but it may not be an actual goal to do so. You can invest your money and see it pay off long-term, and do well with a business partner. You may need to transform your values and what you need to feel worth something at some point in your life. You can make money through something Scorpio-related, like science, secrets, helping people transform themselves or transforming items/property, or in finance. You have no problem giving your money away, having a generous attitude toward money, and you only want as much as you need to take care of the basics and to help other people. You don’t have a problem trying something risky to make more money, and if it doesn’t work out, you dust yourself off and try again. You think long-term when it comes to your finances, and this helps you to improve your finances. You can make money through something Sagittarius-related, like travel, teaching, writing, speaking, expansion, or dealing with foreign cultures/people. You’re not a frivolous person, careful with how you spend, invest, and deal with your money. You exercise caution when making financial decisions. You may come across as a little cheap, and can feel like you have less than you actually do. You can get by on very little, and over time, build up your finances so you’re more comfortable later on in life. You can make money through something Capricorn-related, like politics, as a boss or entrepreneur, working with people older than you or with your parents, as a planner, or a career counselor. You don’t care very much about money emotionally, keeping your emotions separate from your financial life. Money may come and go for you in spurts, and you may find yourself in jobs where you don’t have a stable income, like working on commission or in sales. You can come up with unique ways to make money, ways that no one else would think of, and can throw yourself into it on a whim. You can make money through something Aquarius-related, like technology, as an inventor, in science, helping people realize their dreams, or that focuses on the future. You don’t take your financial life very seriously, or at least not as seriously as you should. You can be lackadaisical with your finances, coming up with fantastical schemes to earn money that never pan out or you never follow through with, and you can have a hard time keeping tabs on your finances. A budget may seem foreign and incomprehensible. You can trust people too much with your finances, and need to be careful you don’t get swindled out of everything you have. You can make money through something Pisces-related, like spirituality, the metaphysical, music, podiatry, or helping others. With your natal Sun in the 2nd house, security is important to you, and you have strong ties to your possessions. You need to learn that who you are is NOT what you own, and that no matter how much money you have, it doesn’t make you a better person. Develop strong values, and find your worth through your positive attributes. You’re someone who can stick though anything, and won’t go anywhere, no matter what happens. Everything lasts with you for a long time, and that’s something to be proud of. You can build a strong foundation for your personality and life to be built on, and once you do, nothing can tear you down. You tend to be good with money, and this placement can be good for making money through being in the public eye or physical activity. How much money/possessions you have has an impact on your emotionally and dictates your feelings of security. If you feel you have enough, then you’ll feel great; if you don’t, you may go a little bonkers. For some, this may make you a sharp money manager, keeping track of every single penny and making very good long-term investments. For others, this may make you squander money by buying too much, acquiring things because it provides a temporary high (obviously this placement can be prone to shopping addiction if the Moon is difficultly aspected). You’re likely a collector of something, and have a hard time parting with things (just don’t become a hoarder!). You need to strengthen your emotional/spiritual/familial foundation to help you have long-term security. A happy home equates to a happy life for you. You’re not prone to expressing your feelings when you feel them, and you probably go over them carefully before showing them. This can be good in that you don’t say anything you’ll regret, but it can also mean you regret not saying something sooner. You may be strongly attached to your values, and developing a strong value system can help you, so long as you don’t go overboard and become preachy. With your natal Mercury in the 2nd house, you tend to be more logical, not needing to dig and look around for the answer to problems. You can use what you already have to solve them. You take your time when making decisions, not seeing the point in rushing. You also take your time when learning new things or taking in new information. You can focus on one project or idea at a time, and have a hard time dealing with more than one at once. Once you set your mind to something, there’s no convincing you otherwise, no matter how much the facts may be stacked against you. You can be good with financial planning, and this is a good position to make money through technology, communications, writing, or as an accountant. With your natal Venus in your 2nd house, you want possessions that are of value, and tend to be drawn to expensive but tasteful items. You like to buy things and may give many gifts, but you expect something in return when you do. You can use gifts as a way to win people over. In love, you take things slow and let feelings slowly grow. You need love that’s secure and stable, and you can be quite loyal and sensual. With the 2nd house ruling money, you can make money in your life through the arts, in the beauty industry, as a negotiator, mediator, or in law. You also tend to have a way of having the money that you need at all times, and require a certain amount of money to feel secure and comfortable in life. With your natal Mars in your 2nd house, you take a slow, steady approach. You’re a hard-worker and understand that you have to dedicate yourself to things if you want the kind of material security that you crave. Some of you may have a hard time holding onto your disposable income, and money burns through your pockets. You’re sensual and connected to your body, needing physical experiences. Your energy isn’t a burst, but rather a slow burn that can sustain your for a long period of time. You have staying power, stamina, and can work on projects until they’re done, no matter how long it takes. Since the 2nd house can show how you best make money, you could work on your own, in sports or physical fitness, in the military, or in the entertainment industry. With your natal Jupiter in your 2nd house, you can seem to be lucky when it comes to money, and whenever you need some, it somehow comes. This can make you take advantage though, believing that you don’t have to work for financial prosperity and everything will be given to you. Try not to do this. Put in some effort, and you’ll have more than you can imagine. The 2nd house rules money, so Jupiter here can show that you can make money through writing, speaking, travel, language, dealing with other cultures, the law, or teaching. You’re also quite sensual and like to indulge. With your natal Saturn in your 2nd house, you may have difficulty attaining the things that you require for stability and security. For some, this can mean that you don’t have the possessions you want or items of value that you crave, and even though you may have your necessities, you don’t feel it’s enough. You don’t like to gamble with your security, and will take a more cautious approach. This can work for you if you embrace it, and material security can grow later in life. The 2nd house can show how you make money, so with Saturn here, you could work in politics, government, in business, as a CEO, executive, some sort of leader, manager, or in the public eye. With your natal Uranus in your 2nd house, you don’t care about money and objects in the same way as everyone else does. Some of you may have no attachment at all to your possessions and live a minimalist lifestyle. Others may use them to get closer to the lifestyle that you want. You want to be as free as possible, so objects can be seen as something that holds you back. You may value having financial stability more than having possessions, so you can work at having plenty put away for rainy days and emergencies. You can experience periods of extreme financial success and failure. Since the 2nd house rules money, planets here can show how you can make money, so with Uranus here, you could make money through technology, science, innovation, original ideas, in a group, or through friends. With your natal Neptune in your 2nd house, money doesn’t mean as much to you as it does to everyone else. You may try to live as simple of a life as you can, but at times, this may hurt you, and you sacrifice too much, including the basic necessities. You can give a lot of your money away because of your compassion, but need to make sure you don’t give away so much that you’re angry about it afterwards. Make sure you have developed your sense of self-esteem, and you’ll usually avoid the pitfalls that come with this placement. 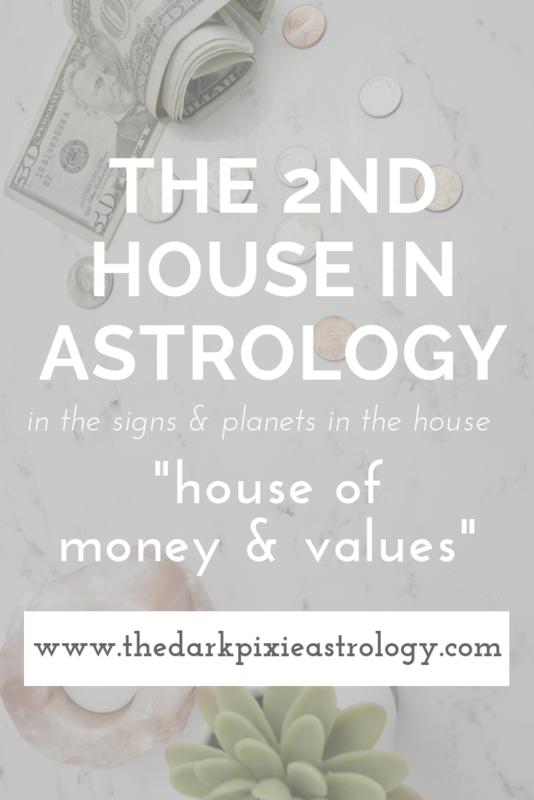 Since the 2nd house can show how you make money in life, with Neptune in this house, you can make money through the arts, music, something to do with feet, or water, or through the metaphysical, spiritual, or subconscious. With your natal Pluto in your 2nd house, you want possessions to give you a sense of power and control in your life. The more you have, the more powerful you feel. You’re not a fan of sharing, and want to keep what you have for yourself. You can do well with investing and creating long-term financial plans for growth. Since the 2nd house rules money, any planet here can show how you can make money in life, so with Pluto here, you can make money through research, science, the occult, hidden things, transformations, using other people’s money, forensics, or psychology. With the transit Sun in your 2nd house, your focus is on your material wealth. You may try to work out your finances so you feel as though you have more money, or do some extra work to make more. Having more disposable income makes you feel more secure, as well as having more objects that are of value, so you may purchase something that will be worth more over time. Just make sure you don’t spend too much on it now. You may seem more grounded and practical, and you don’t want to rock the boat. You likely won’t start much new during this time, and instead continue to work on the projects that you’ve already started. Finances are tied to your emotions. You may feel you need more money, and that may be true, with an expense coming up, or it may just be an emotional need. There’s a greater chance of impulse buying because you’re emotionally drawn to items, so make sure you’re spending your money wisely, otherwise you may end up with debts you don’t want (or need). How your self-esteem and your monetary status are linked may be clear to you now, and any changes that need to be made with that relationship can be done. Making a change in your value system could also be made at this time. Your security is linked to your money during these few days, so what you have may affect how you feel. When this transit is handled well, you can be more practical about your life and feel more grounded, enabling you to be better able to deal with important matters. On the flip-side, you could seem a little predictable and boring during this transit, so don’t schedule anything now that requires you to break out of the box and be daring. You may need to watch for overindulgence, especially food-related (and especially if you’re watching your weight! ), so remember everything in moderation. If in a relationship, you may feel a surge in romantic attraction, and want to do something special for your honey. With transit Mercury in your 2nd house, you take your time when making decisions. You don’t want to rush into anything, no matter how soon the deadline will be here. If you have to work with others, they may have a hard time dealing with your slower approach. You take in information easily through experience and your senses, and you remember sights, smells, tastes, and sounds. You may want to purchase something that’s a little splurge, especially something electronic. This is a good time to sit down with your budget and really get into the details of it to come up with a detailed plan and get your finances in order. When transit Mars is in your 2nd house, you’re driven to have more security in your life. You want to be financially sound, and can work harder at making more money. You may take on a second job, start a side gig, or pursue some sort of money-making venture. The more money you have, the more secure you feel. Conversely, you can also spend more money during this time, not paying attention to how much you’re spending and blowing through money quickly. You may strongly defend your beliefs, identifying with them more. This can be a good time to evaluate your values and make sure they fit with your life now. You want more stability, and are less likely to take any big risks. You keep your nose to the grindstone, working on things you’ve already begun. When transit Jupiter is in your 2nd house, you can experience an increase in self-esteem and self-worth. You may focus on your value system and make adjustments to them, or make adjustments to your life that are more in line with your values. You’re not up for trying anything different or drastic with this transit, and stick to the traditional and to things you’ve tried before. Nevertheless, this aspect can be good for your finances, and you can be presented with or make opportunities for yourself that will increase your financial status. You can also purchase more items of value, and be more materialistic, which can make you spend more than you should, so while you can make a lot of money, you’re just as inclined to spend a lot as well. You should have a productive year no matter what, and get a lot done that needs to be done. You may also be sensual and indulgent. When transit Saturn is in your 2nd house, you must work hard, and you take a more practical approach to what you do. The 2nd house rules your finances, and while Saturn is here, you may feel financially insecure, especially at the start of this transit, even if you’re not actually financially strapped. It’s just worry that something could happen, and you want to secure yourself by having a better cushion. The chances of something actually happening tend to be lower during this transit. This is an excellent time to save instead of spend, to create a long-term financial plan that creates stability in your life, to conservatively invest, and while you may not win the lottery, you can see financial growth over the period of this transit that’s slow but steady. You can learn how to work hard and yield results. When transit Uranus is in your 2nd house, you change your core value system, opting for values that are more progressive and with the times, or in with the future times. You can have an erratic time financially, where you have more than enough money sometimes, and nowhere near enough other times. This can be a period where you earn money in spurts, work freelance, on commission, or through risky ventures that can make you rich or leave you in poverty. Pay attention to your original ideas and innovations, and use that to increase your personal wealth. When transit Neptune is in your 2nd house, you can have a hard time being responsible with your finances, and may not pay attention to where it’s all going. Then you’re suddenly broke and don’t have enough for your necessities, and you’re scratching your head, unsure of where it went. You can be taken advantage of by people who want to take your money away from you. Be more careful with your finances. This can be a good time to make money through the arts, feet, water, or the metaphysical. When transit Pluto is in your 2nd house, especially during the beginning, you can experience a period where you lose everything you think that you need for security and safety in life. They’re likely things that you don’t really need and have been keeping out of fear, and you need to let them go and build greater confidence in yourself and inner strength so you’re not relying on anything outside of yourself for security. You may lose a lot during this transit, physically, mentally, emotionally, but walk away much stronger.